Internationally acclaimed German-Canadian singer Michael Schade is considered to be one of the leading Mozart tenors on the stage today. He is seen regularly in many of the great opera houses of the world including the Vienna Staatsoper, the Salzburg Festival, the Dresden Staatsoper, the Metropolitan Opera, La Scala, l’Opéra de Paris, the San Francisco Opera, the Lyric Opera of Chicago and the Los Angeles Opera. 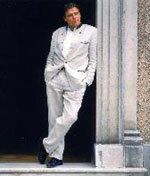 In addition to his thriving opera career, Mr. Schade performs extensively in recital and concert. His many solo recitals have taken him to such concert halls as the Musikverein in Vienna, Wigmore Hall in London, Alice Tully Hall in New York and the Concertgebouw in Amsterdam and he has appeared with major orchestras in Europe and North America, including the Philadelphia Orchestra, Concentus Musicus, the Los Angeles Philharmonic, the Vienna Philharmonic, the Berlin Philharmonic and the New York Philharmonic. Mr. Schade’s career was launched in Vienna in 1991 when he was asked to fill in at the last minute in a production of Il Barbiere di Siviglia at the State Opera, and the rest, as they say, is history. He quickly became a favourite in Vienna and has sung many of his most acclaimed roles there. Mr. Schade appears regularly with Nikolaus Harnoncourt’s Concentus Musicus and the Vienna Philharmonic and at the Schubertiade in Schwartzenberg. Michael Schade’s attachment to Vienna is more than just professional - he maintains an apartment in the centre of the city, with a view over its spectacular rooftops. A great wine and food aficionado, he has even written a short guide to his favourites haunts in Vienna. The Salzburg Festival is Michael Schade’s second European home – he has appeared at the Festival almost every year since 1994, always to great acclaim. Michael Schade has recorded with many of world’s most prominent conductors: Nikolaus Harnoncourt, Claudio Abbado, John Eliot Gardiner, Pierre Boulez, Helmuth Rilling, Sir Colin Davis, Sir Charles Mackerras, Wolfgang Sawallisch, Myung-Whun Chung, Richard Bradshaw and Trevor Pinnock. Michael is one of the featured singers on Hyperion’s great Schubert recording project. His his first solo recording on Hyperion was released in August 2002. An international award-winner, Mr. Schade’s recording of Bach’s St. Matthew Passion with Nikolaus Harnoncourt won the 2002 Grammy for Best Choral Performance and Soirée Française with baritone Russell Braun, received both a Juno Award and the Gabriel Fauré Award in France. Michael shares his time between Europe and North America. His home in Oakville, near Toronto, is a centre of musical activity where evenings of song shared with friends also support his fundraising activities for leukaemia research. His wife Norine Burgess is a mezzo-soprano with an international career and their daughter Sophie is a violinist. As well as his personal interest in supporting leukaemia research, Michael can always be counted on to participate in fund-raising activities for the Canadian arts community.